I/O Ports: 1x FireWire (IEEE 1394), 1x 56K Modem, 1x Gigabit Ethernet, 2x USB Ports, 1x Audio-Out Port, 1x PCMCIA Card Bus Port (Supports Type I and II Cards), 1x S-Video Out Port and 1x VGA-Out Port. 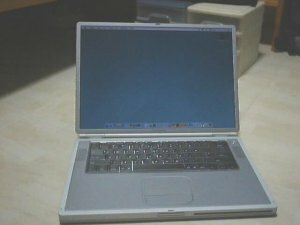 As always, Apple has been reputed to pay a lot of attention to details in its product line, and the PowerBook G4 Titanium, Apple?s top-of-the-line notebook, is no exception. The PowerBook comes in an elegant box that portrays the exact replica of the notebook in various angles, with a carrier handle to match. Inside the box, lies the notebook, well wrapped by a bubble bag and underneath it, being tucked away neatly, are the documentations, charger, and other accessories that comes with the standard PowerBook package. The hardware contents of the equipment pack included consists of almost, if not complete, the things needed to get up and going almost immediately. These include an ultra thin 56K Modem cable (telephone line) for connecting the PowerBook to a dial-up network and an S-Video Out to Video Out converter for hooking up the PowerBook to a large TV display for mirroring or desktop stretching. A slim, elegantly designed charger is also included in the package, along with a leading 55 Watt-Hour lithium ion battery that boasts up to 7 hours of uptime. Documentations includes the Mac OS X instruction manual, machine documentation and warranty booklet, while the software bundle includes a Mac OS X CD, Mac OS 9 CD, Software Restore CDs (3 pieces) and an Applications CD. Unlike other PC notebook manufacturers, the software bundle that is included with the PowerBook and the full line of products of Apple is very impressive indeed. Instead of just giving one Recovery CD like what the PC counterparts do, Apple provides the end-user with the Operating System CD itself (both OS X and OS 9) and a separate Applications CD to allow the user to fully customize the setup of the system. Also, this makes upgrading of the hardware, particularly the hard drive of the system easier as, unlike Recovery CDs, the capacity/cluster size/format of the hard drive does not need to be identical to the original hard drive in order to restore your system. However, if one does need to restore the system to factory defaults, Apple also provided a System Restore CD pack of 3 CDs to do that too. The heart of the PowerBook G4 Titanium is a very fast PowerPC G4 550 MHz chip, capable of processing data in 128-bit chunks instead of the usual 32 or 64-bit chunks achieved by PC counterparts. The chip is also able to perform up to 4 (sometimes 8) simultaneous 32-bit floating point calculations in a single clock cycle, 2 to 4 times faster than processors found in PCs. This wickedly fast chip is aided by a 256 KB cache and 512 MB of memory, making this a supercomputer clad in a 1 inch thick form factor (with lid closed). 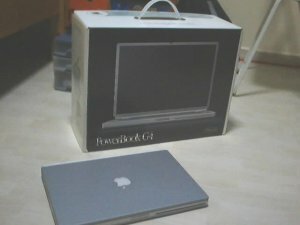 The PowerBook G4 Titanium really isn?t called the Titanium for nothing. It is, literally clad in a titanium alloy that saves weight and maintains the notebook?s durability. 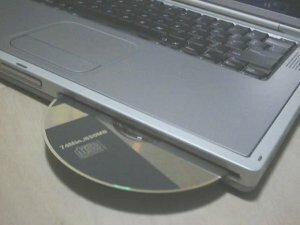 With a slot-in DVD-ROM/CD-RW Combo Drive that is capable of playing DVDs and burning CDs thrown in, plus a 15.2? LCD unit, supported by the fast ATI Mobility Radeon 7500 with 16 MB DDR video memory, this is one notebook you want to be seen with. Flip open the slim titanium lid, and you?ll find a larger than normal keyboard welcomes you, which accounts for better typing posture and ease of typing. A tastefully designed power button sits on the top right corner of the layout. Power up the machine and you?ll hear that familiar startup chime that all Mac users get very accustomed to and a fresh new look of Mac OS X awaits you. Look around the machine carefully, you?ll find large ventilation vents that induces smooth airflow for cooling of it?s internals, and a thermal sensitive fan spins up to life and stops every now and then, helping to keep the internal temperatures at suitable operation levels. The bottom of the PowerBook is designed to be the main heat dissipation surface area, being clad by a large sheet of titanium alloy, and the base is very clean, with no bumps or protrusion at all, except for 4 small rubber feet at the corners of the base. When the LCD display lights up and is in operation, the Apple logo at the back of the lid glows faintly. Prop the lid close again, and this time, you will notice that while the PowerBook goes to sleep, a small led light at the hinge of the lid pulsates every now and then (much like what the Apple iBook), like as if the PowerBook is breathing and really sleeping! The battery features a level indicator on it. Gently press the indicator check button on the battery and a led indicator instantly lets you know how much charge is left. The lid catches on the PowerBook, unlike other notebooks that have protruded catches that can be broken easily, is retractable and magnetic. When the lid is closed, the catch automatically draws down and locks the lid in place. These design flairs typically portrays how much attention Apple pays to details on its line of products. The fast PowerPC G4 550 MHz processor, huge amount of RAM (512 MB) and a large, 256 KB cache, together with Apple?s whole new operating system, Mac OS X, pushes the PowerBook?s performance to the max. Mac OS X is designed to wring every bit of juice out of the PowerPC chip, being optimised to take advantage of the chip?s 128-bit processing ability and preemptive multitasking capability. This combination results in smoother computing on the new OS, and faster performance can be seen and felt at every level of usage, from simple word processing to PhotoShop 7.0 rendering. For example, Adobe PhotoShop 7.0 in Mac OS X took typically only around 15 secs to run and open. iTunes, which is included in Mac OS X, took typically 25s to encode an audio file that is 4 mins and 23 secs long from an audio CD into MP3 format and copy it onto the hard drive, while playing that song being encoded. All these should pretty well hint at the PowerBook?s massive computing power at hand. Given the impressive hardware and software bundle package that comes with the PowerBook, and the immense computing power and unforgettable user experience Mac OS X provides, the PowerBook is well worth its cost. This machine is definitely designed and marketed to target at creative professionals such as photo-journalists, and professional designers that make use of Adobe?s and Macromedia?s wonderful suite of software, not forgetting home/office users too. The PowerBook G4 Titanium really fits in the wanted list of many with its all-in-one package that consists of power, portability, and user-friendliness. It is, undoubted, another legendary Apple product of all time.